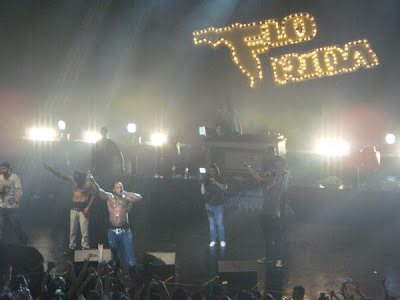 On Friday, May 21 2010 I went to the Flo Rida Concert in Seoul. It was insane! I almost didn't go and my ticket was only booked two days before. I had no idea that Flo Rida could set the stage on fire like he did. He performed songs from his two albums, Mail on Sunday & R.O.O.T.S while the group, Git Fresh performed songs from their album, Booty Music. The concert started a bit late and for about 20-30 minutes in the beginning, there were performances by Korean entertainers. Flo Rida burst on stage getting people on their feet when he opened with In the Ayer. He autographed some towels which he threw into the audience. 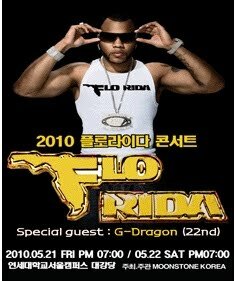 Flo Rida said he came to Korea to find his shawty and proceeded to describe what she looks like - Apple Bottom Jeans, Boots with Fur...yeah, the crowd went crazy! He called some girls onto stage to dance with him as he sang the song that is arguably his claim to fame, Low. Things started to heat up and there were shrieks of joy when he removed his t-shirt! Flo Rida was joined by his official DJ, DJ Entice as well as Git Fresh. The audience interaction was incredible and he even jumped off stage a few times.